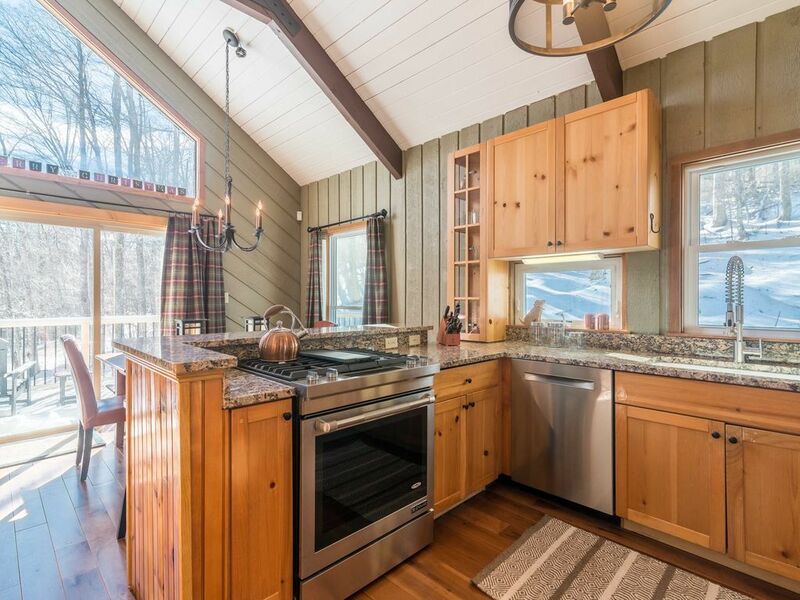 Totally renovated and designer decorated on the Stratton Mtn shuttle route. 4 bedrooms plus a lower level ideal for kids with additional bunk beds, foosball and tv. Master bedroom ensuite located on the second floor with a queen bed. On the first floor there is another master with queen bed, a bedroom with two twin beds, and a bunk room, additionally there is a lower level with bunk beds (with lower bunk being a full bed). There is proper egress for the lower level. Open floor plan, renovated kitchen, all new wood floors, new carpet, brand new baths and all new appliances. Fireplace, beautiful deck, large mudroom and first floor laundry. The house is stocked with all linens and kitchen necessities. Stunning! I own and manage two other Vermont properties at Stratton. My parents purchased this house for themselves. I oversaw the renovations and design. This property was purchase because of its location in Strattonwald. Strattonwald is a community located at the base of the Stratton Mountain access road. Strattonwald is an ideal community in the winter being on the Stratton shuttle route. Bromley Mountain is also located a short 12 minute drive away. In the summer Strattonwald is amazing with its swimming pond with sand beach and floating dock and tennis courts. Leaf peeping in the fall is incredible. It is a speacial place in all seasons. There are two brand new full bathrooms in the house. A well equipped kitchen for a cook. More than sufficient prep items. Totally renovated. Granite counter tops, all brand new stainless appliances. Farm table that seats 10 plus 3 island stools. Excellent place for a ski weekend with friends! The house was perfect for 11 people, has everything you would need and conveniently on the shuttle route to the mountain. The owners were very responsive and accommodated all our needs. We would definitely book this house again! The house was a wonderful retreat close to Stratton, Bromley and town of Manchester. It was well stocked with basic amenities and lots of seasoned firewood to keep the days and evenings toasty. We had a lovely week and the Property manager was quick to reply to any questions or issues we had, which were few. All in all it was a great rental and we would be back again--Thanks for having us! Beautiful home. Well equipped with everything you need for a fabulous fall weekend!! Cozy common space with fireplace was perfect after hiking the AT. We had a wonderful long weekend at retireMont this past weekend and I could not say enough about the location. Absolutely perfect for Stratton and Bromley as well. The interior is very well done and very comfortable, no detail has been missed. What a lovely weekend we just spent at "RetireMont"! The home is very much like it is described and pictured on the rental listing, and they did a beautiful job with the renovations. The kitchen is stocked with everything you could need, and the open floor plan makes for a convenient and social gathering spot. The home definitely is "cozy," meaning it's not huge and our group of 13 was fairly packed in. Another thing to note is that there is no air conditioning and not every room has a ceiling fan which can make for some sticky evenings (even with open windows). Lastly, our group misunderstood from the pictures and thought that the house was right next to the lake/tennis courts shown. Those actually are about a 3-minute drive away which is unfortunate (JUST long enough to not really be walkable for the kids). Once you're there, though, the lake is really spectacular and made our summertime visit just perfect. Clean and serene with a patch of sand and some flat grass areas with picnic tables. The kids had an absolute blast, and this was a great feature of the rental. The rental also is in a really good location, and the local Winhall Food Market (just a few minutes' drive from RetireMont) has a surprisingly good selection of food and wine. Overall, we had a really wonderful visit and would definitely come back! Thank you, Tom and Kimberly! We had an incredible stay here. It is conveniently located from Stratton Mtn. - about a 5-10 minute drive. The house is charming and cozy. It seems to have been recently renovated and the decor is beautiful. We were more than impressed with our stay and will definitely be coming back! The owners were also very responsive whenever we needed anything. Located on the shuttle route to Stratton. You are located minutes from the village at Stratton Mountain. Skiing, snowboarding, cross country skiing, snow moiling, snow shoeing, restaurants, sports center, golf and tennis. 10 minutes to Bromley Mountain, 18 minutes to Manchesters outlets and shopping.